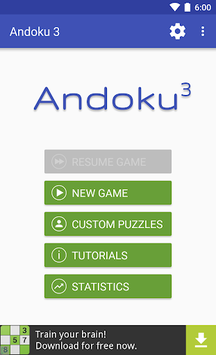 Andoku Sudoku 3 is a Sudoku number puzzle game for smartphones and tablets. The game contains Sudoku puzzles of various difficulty levels and detailed instructions. It is aimed at beginners and experts alike. 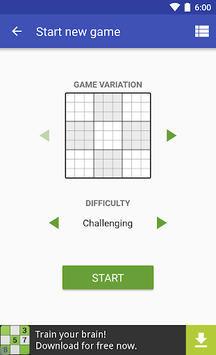 Andoku Sudoku 3 comes with tutorials that teach you many solving techniques. Based on specific game situations, the tutorials explain the solving techniques step by step. The solution techniques are ordered by difficulty, ranging from very simple (Introduction, Hidden Single, etc.) to very difficult (XY Chain, Sashimi Swordfish, etc.). Would you like to solve a Sudoku puzzle from your local newspaper on your smartphone? 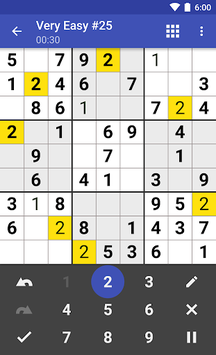 With Andoku Sudoku 3 you can easily enter your own puzzles. The game allows you to save your progress in the cloud. This also allows running games to be synchronized between different devices. You can start a game on your smartphone and continue to play on your tablet later! With this version you can decide whether to mute full-screen ads or not. There is now an option to request only silent ads from the ad network without muting all sounds while the ad is showing. This allows you to continue to listen to background music or podcasts while you are playing. • Added support for Android Pie 9.0. • Redesigned widget for game variation and level selection.